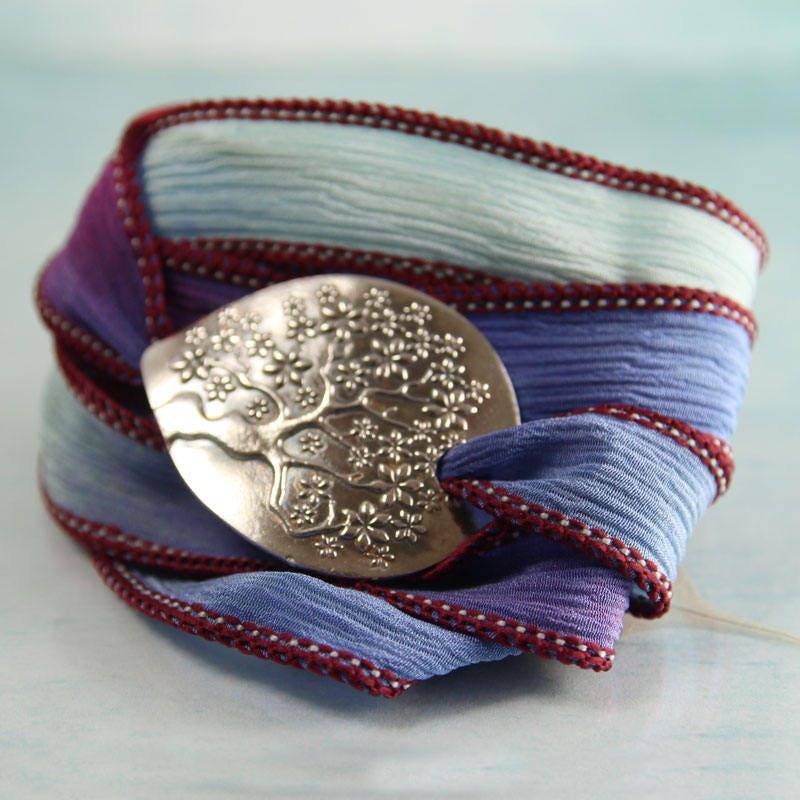 Add a touch of romance to your next ensemble with this tree of life silk ribbon wrap bracelet. 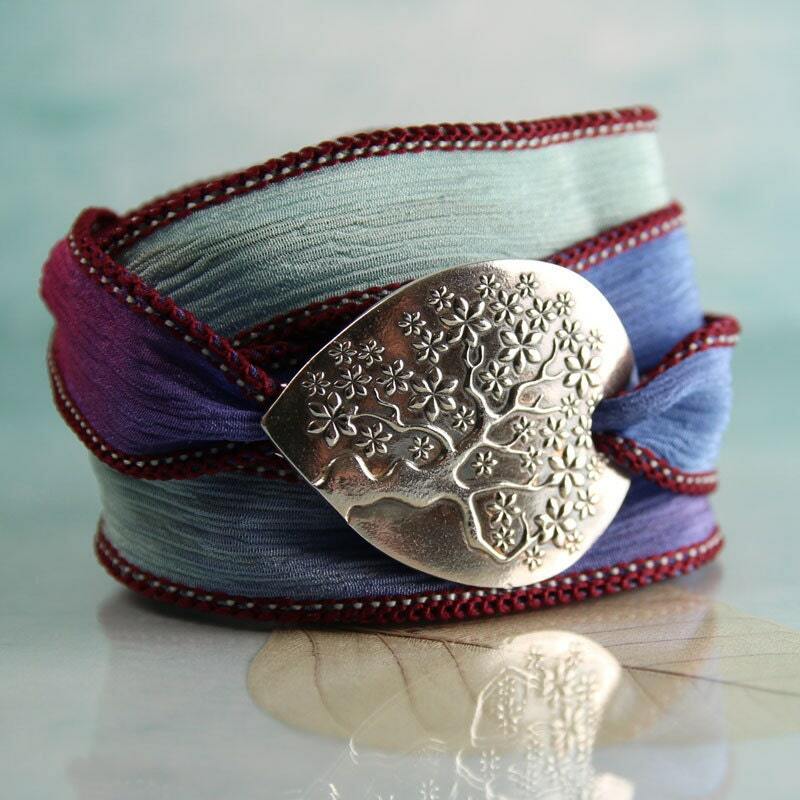 Custom handmade from recycled silver and hand-dyed silk, this bracelet is gorgeous summer bohemian chic. 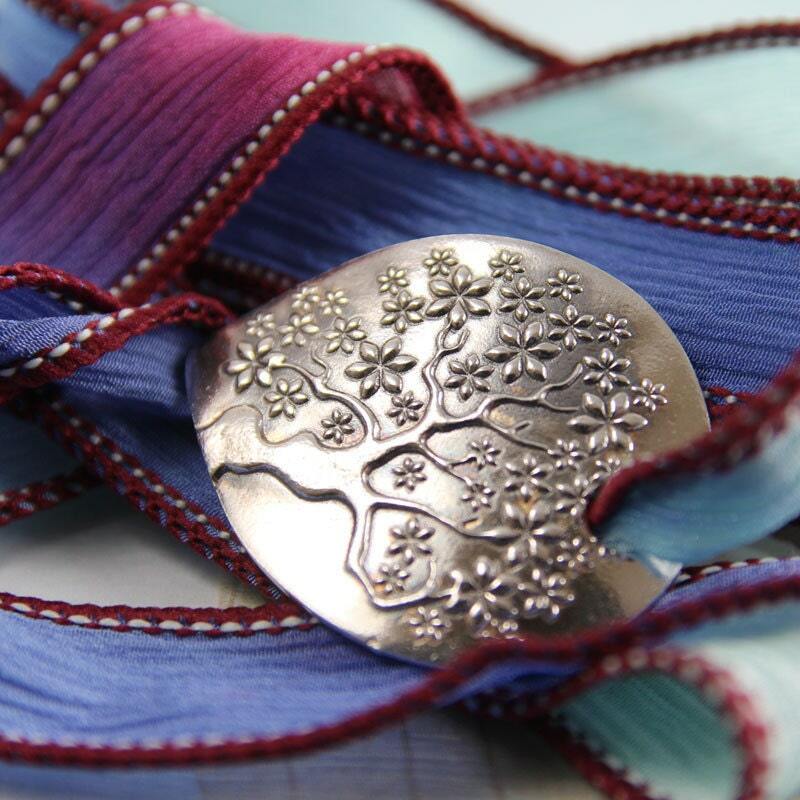 It features a handmade silver focal adorned with a glorious tree of life motif. 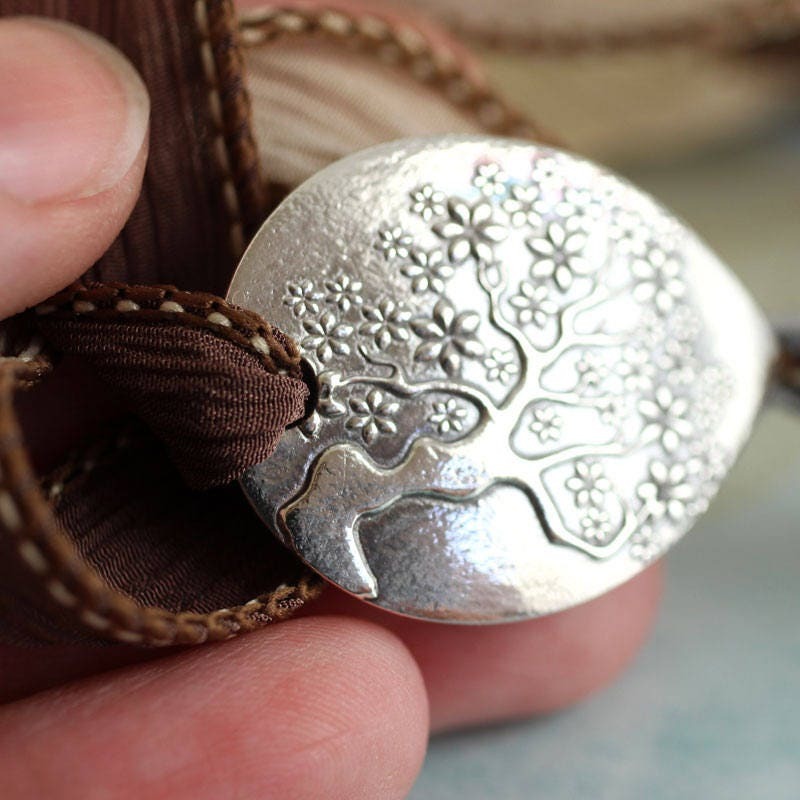 The tree of life denotes growth, protection and strength. This is an exceptional piece to give to a friend or loved one suffering from illness or worldly problems. It also will make a lovely addition to your jewellery collection. Wear it any time you want to weave a little love spell on someone you hold dear. I have shaped and stamped the slide by hand from recycled silver in metal clay form, then fired and polished to a high shine. 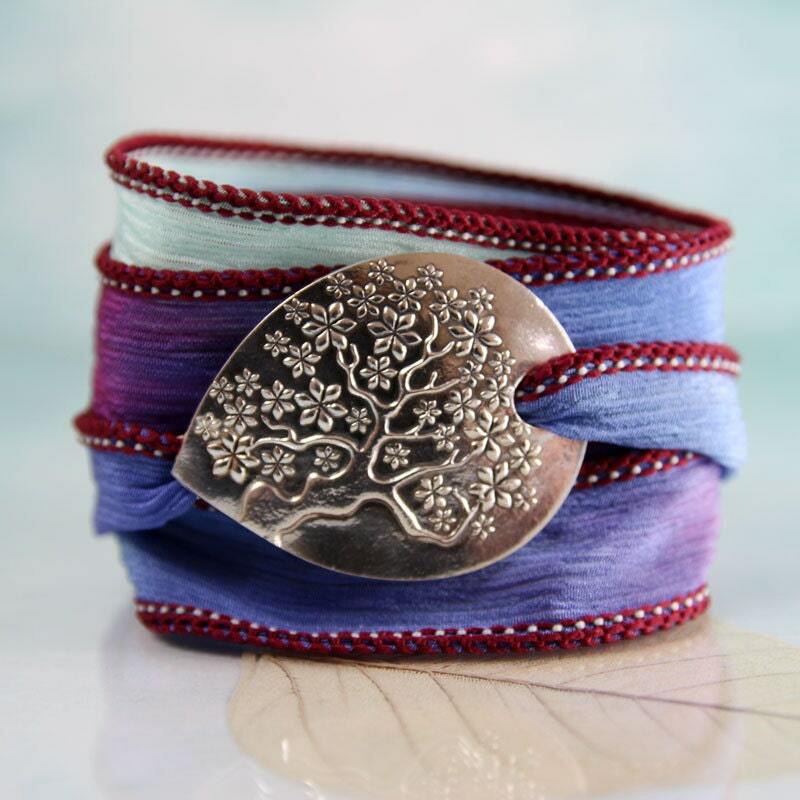 The claps has a wonderful old, gnarled cherry tree in full bloom.The soft silk ribbon wraps around your wrist about 5 times. 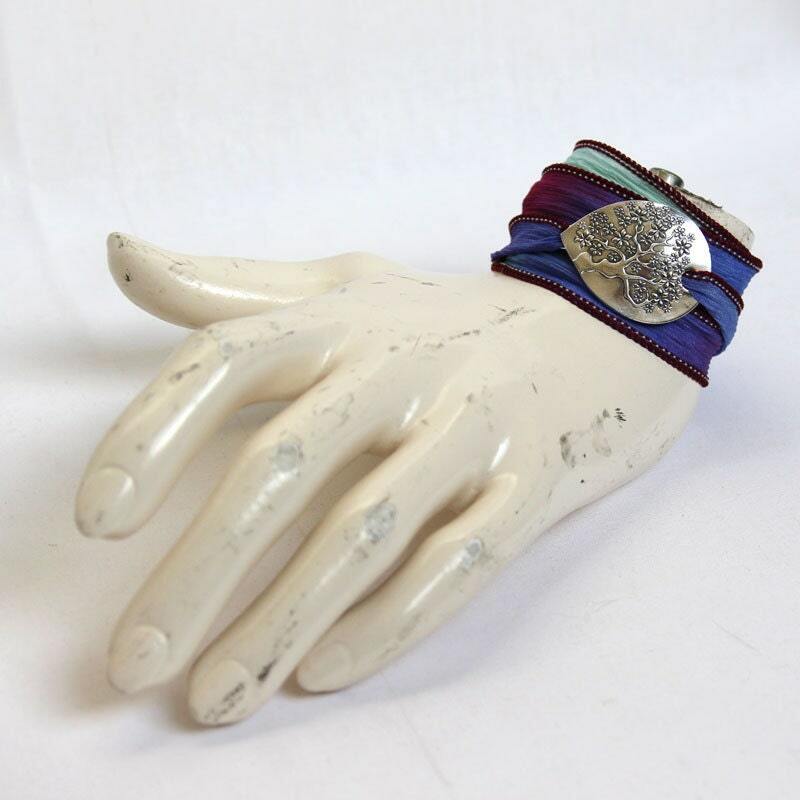 Just wrap around your wrist, knot and tuck in the ends. 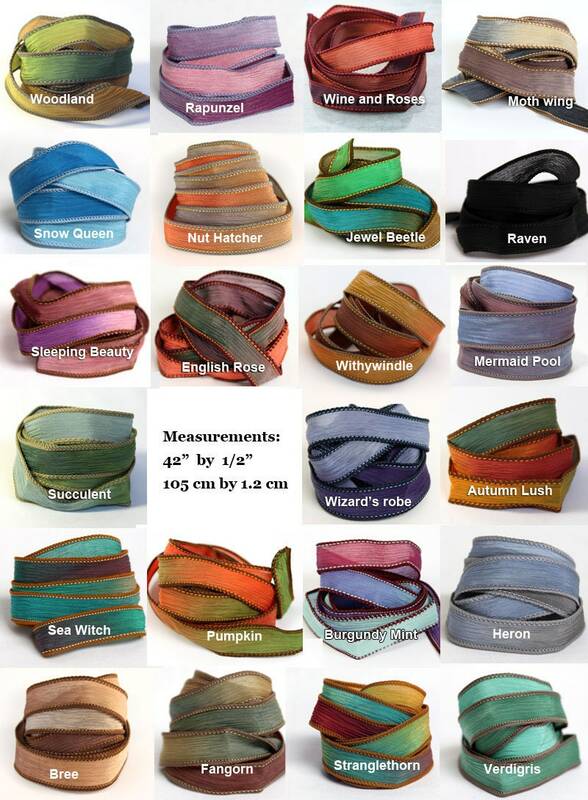 To choose your ribbon; have a look at my current selection in the last photo and choose from the drop down list. Unique gift, arrived very quickly and nicely packaged. Lovely item. 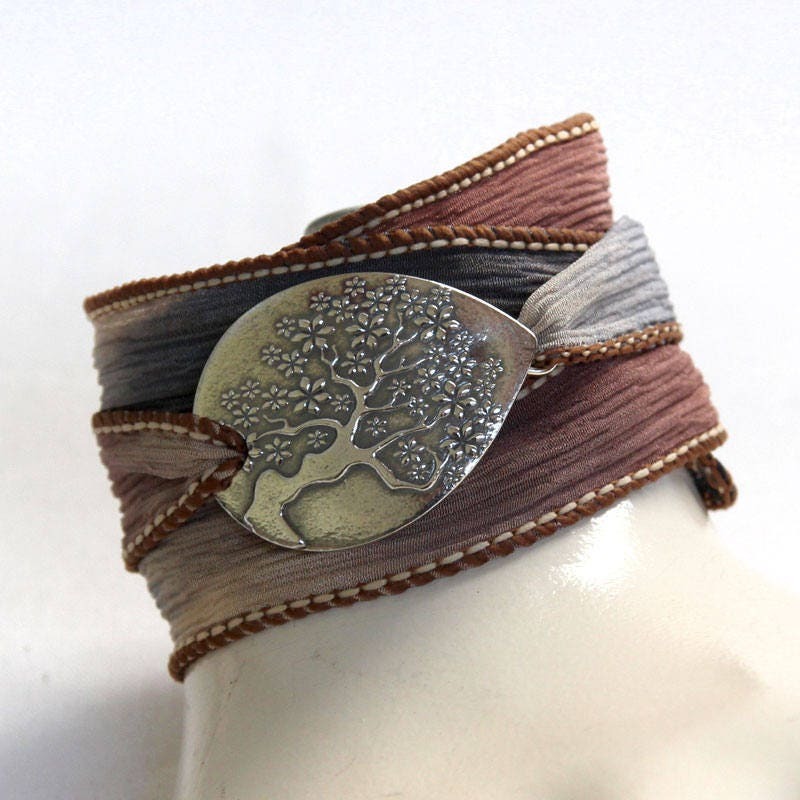 This bracelet is truly beautiful, well crafted and intricate. It looks nice in the pictures, but comes even nicer. Super fast delivery- would happily buy again! Thank you. Absolutely beautiful. My friend loved, loved it!! The service was perfect!!! 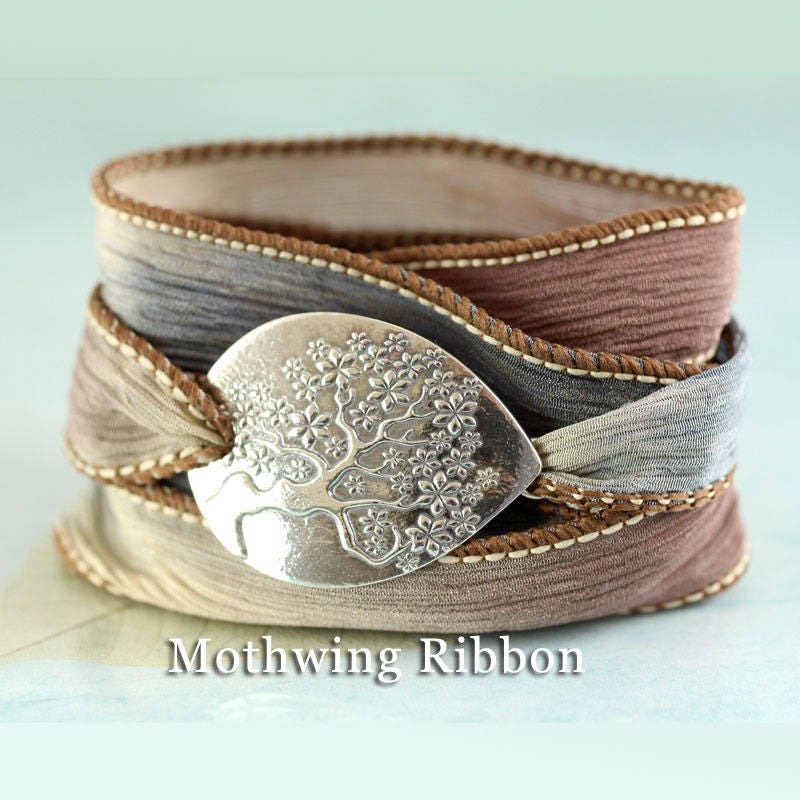 Beautiful bracelet with interchangeable ribbon - a gift for my daughters 13th Bday and she loves it - thank you. 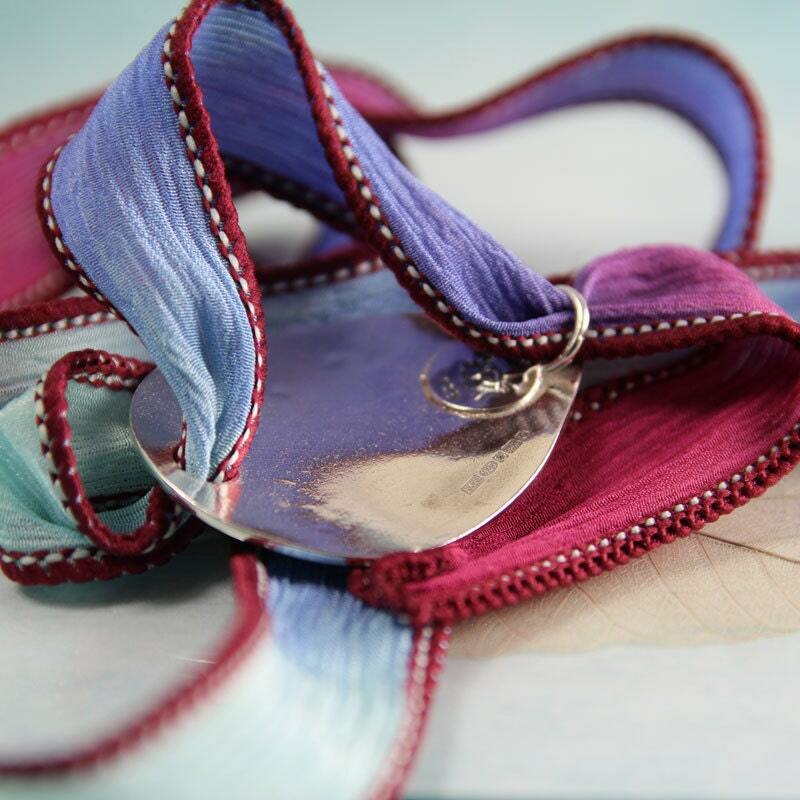 Simply stunning bracelet and very quick delivery just before xmas! Thanks, Nana.